Desert Camp Sakina (meaning peace, tranquillity and calm) is the ultimate ‘get away from it all’ destination. It is only available for exclusive rental. Owned and operated by Erg Chigaga Luxury Desert Camp, Desert Camp Sakina offers you the opportunity to enjoy the desert in complete serenity. The camp has 4 en-suite luxury tents. It is perfect for friends, family, small groups, honeymooners or those that just want to recharge in privacy. The location is idyllic. On the edge of the Chigaga dunes, the camp is located far away from any other camps. It is surrounded by dunes. From the top of the dunes all you can see are more dunes, the occasional wispy tamarisk tree, and in the far distance ochre coloured mountains. At the private camp there are four en-suite sleeping tents. The camp has many relaxing areas and hammocks. Each tent has a king-size bed (which can be made into 2 singles). There are ‘wall-to-wall’ plush rugs, a full-length mirror, bedside tables, solar-powered lighting, an armchair and space to hang your clothes. Each item has been handmade in Morocco. We have also sourced high quality individual sprung mattresses, percale cotton sheets, duck down duvets and lovely pillows. The en-suite bathroom has a toilet, dressing table and silver pewter buckets for washing. Breakfast is served under the morning sun, and dinner is served under the stars. Cold drinks, including beer and wine, are always available. Relaxing area with day beds and cushions are set up outside. Whether booked by a couple or by a group of up to eight, the camp is always reserved on an exclusive hire basis. There is really no such thing as a typical day, given that everyone wants to do different things at different times. Maybe though this will give you an idea of what you might do on an average day (if such a thing exists). Times do change slightly depending on the season. Wake up at 05:30 and walk up the big dune for sunrise. About 1 person in 20 does this. I suppose it depends on whether you are a morning person, or not. Crawl out of bed for a leisurely breakfast at about 08:00. At about 10:00 depart for either a leisurely one or two-hour camel ride or trek and return for lunch at the camp, or have a camel ride for an hour or two followed by a picnic lunch under a tamarisk tree in the dunes and return at about 16:00 by camel to the camp. At between 17:00 and 18:00 (depending on the time of year) walk up to the top of the dune for sundowners and watch the sunset. Return to camp at about 19:30. Watch the bread being baked in the hot sand. Dinner is served at about 20:00 and then retire to the fire at about 22:00 and listen to or join in with the drumming and singing, watch the stars…have a night cap, and perhaps eventually go to bed. And on the second day you can go for a guided walk, sand board, wind away a few hours in the hammock, or go to the oasis for lunch. There’s a particular isolation that’s only found in the desert. Its one of distant silhouettes blurred bu hazy heat, shimmering sunsets over blood-red dunes and stars shooting silently across a sky of constellations. It’s about being lost in vast openeness and becoming grounded by the process. 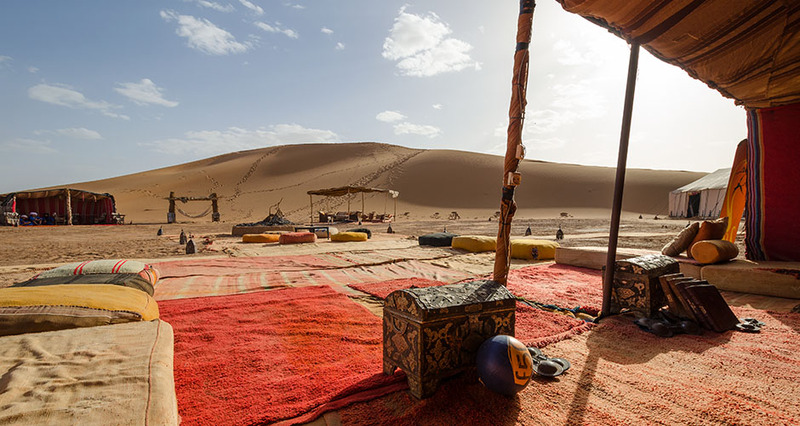 Deep in the Moroccan Sahara is … [Desert Camp Sakina] … with four Berber tents that sleep up to two each, lined with thick, wall-to-wall rugs and with hammocks slung from their ceilings. It’s an hour’s camel ride from a larger camp and all you have for company is a cooler box and supplies and each other—as well as a guide to serve you sundowner drinks on the dunes and dinner beneath the stars. Then there’s just the silent night ahead before trekking back to civilisation before the sun rises to its full intensity the next day. 250 euro per person per night for three to six people. For seven or eight people, it is 235 euro per person per night. All meals, drinks, camel treks and activities are included. The price of a 7-night package starts from 1600 euro per person. This includes 3 nights in Marrakech, 1 night at a guesthouse en route to the desert, 3 nights at the private desert camp Sakina and transport in a 4WD with driver (who is also your guide). Included in the package is breakfast in Marrakech, breakfast and dinner at the guest house en route, and all meals, drinks and camel rides at the private Desert Camp Sakina. All the packages are private and tailor-made. The duration can be lengthened or shortened in accordance with your wishes. Riad Adore: 1600 euro per person. 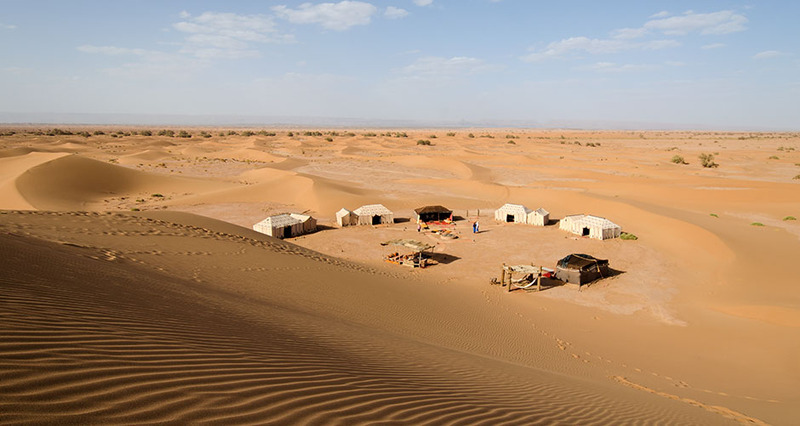 We offer private and tailor-made 3, 4 and 5-day trips to Desert Camp Sakina. In an ideal world the trip from Marrakech to the desert (and back to Marrakech again) is a five-day adventure, with plenty of time to enjoy the magnificent landscapes and sights. On the 1st night you would overnight at a guesthouse, then spend 3 nights at the desert camp and return on the 5th day to Marrakech. The route to the desert is circular, the trip back being shorter and more direct. All the trips are private and tailor-made. Start times, places to stop, duration of stops and lunches are decided by you. However, ‘the ideal world’ does not always exist. We therefore also offer 3-day and 4-day tours, if you only have limited time. The cost of a 5-day tour is 2640 euro for 2 people. This includes one night at a guesthouse en route, three nights at the private desert camp and the transport in a 4x4 Land Cruiser with driver. The cost of a 4-day tour is 1900 euro for 2 people. This includes one night at a guesthouse en route, two nights at the private desert camp and the transport in a 4x4 Land Cruiser with driver. The cost of a 3-day tour is 1700 euro for 2 people. This includes two nights at the private desert camp and the transport in a 4x4 Land Cruiser with driver. At Desert Camp Sakina camp all meals, all drinks, camel treks and activities such as evening sundowners on the dunes and sandboarding are included. All the trips are private and tailor–made. We can therefore adapt any of the itineraries to suit your requirements. The trip to the desert is completed in one day, with two nights being spent in the desert camp and the return to Marrakech in one day. Overnight at a guesthouse en route to the desert. This is either a 3h 30min drive to the guesthouse of Kasbah Ellouze near the UNESCO heritage Kasbah of Aït Bennadou, or a 5-hour drive to the guesthouse of Kasbah Azul in the Draa Valley. The route is via the High Atlas Mountains and Tizi n’Tichka pass (alt. 2300 m) and the Ounila Valley, full of ancient villages and kasbahs. 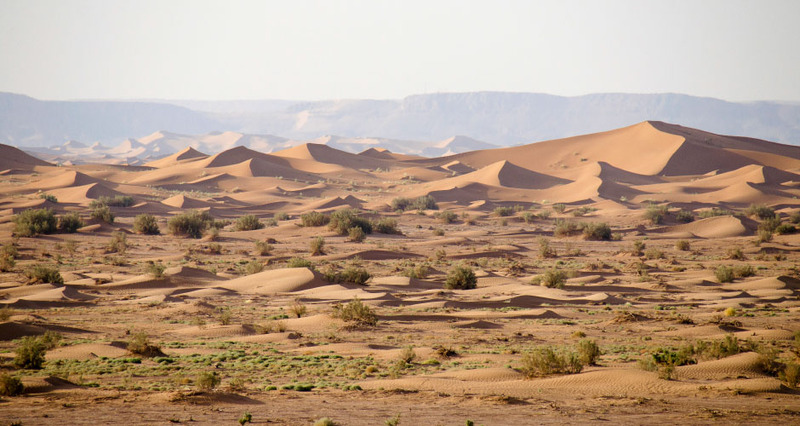 It’s a 5-hour drive through the Draa Valley (home to 3 million date palms and hundreds of kasbahs), Zagora, Tamegroute (famous for its green-glazed pottery and ancient Koranic library), M’Hamid (where the tar road ends and the Sahara begins). Both days at Erg Chigaga Luxury Desert Camp. There are plenty of activities for those that either want to remain at the camp or venture into the desert. Return to Marrakech. The return trip is 8 hours, and is more direct and more remote than the route to the desert. The return trip is via Foum Zguid (3-hour drive though the desert), Tazenakht (known for its rugs) and then back over the Tizi nrsquo;Tichka pass. 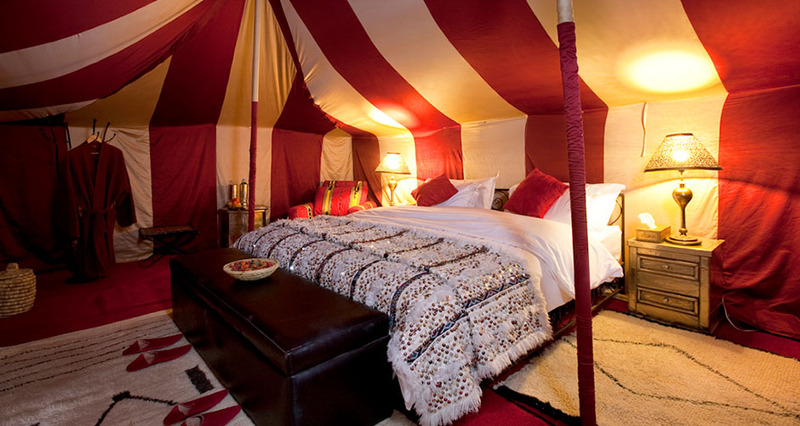 2 nights at Erg Chigaga Luxury Desert Camp. All meals, drinks and guided trips on camels are included. Other activities, including sandboarding, sundowners on the dunes and informal singing and drumming around the fire are also included. Private transport in a 4x4 Land Cruiser with driver. Click here to find out more details about the route to the desert. A very popular trip is to combine Marrakech, Fez and the desert. The trip below is just a sample itinerary and can be adapted to your specific wishes. We can also include trips to the coast and Essaouira. 4 nights at Riad Laaroussa in Fez. 3 nights at DESERT CAMP SAKINA. 1 night at Kasbah Ellouze near Aït Bennhadou. 3 nights at a Riad Adore in Marrakech. Transfer from Casablanca airport to Fez. Flight from Fez to Zagora. 5 days of transport in a 4WD Land Cruiser with driver. 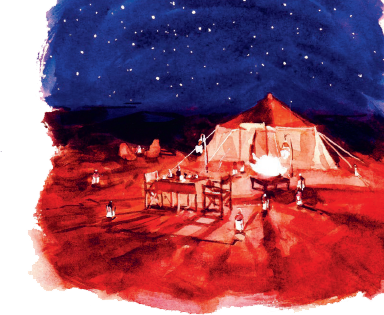 At the desert camp all meals, all drinks and guided excursion by camel are included. In Marrakech and Fez breakfast is included. At Kasbah Ellouze breakfast and dinner are included. The recommended 11-day trip provides enough time to relax and enjoy. However, it can be lengthened or shortened, and the itinerary amended in accordance with your preferences. Firstly, the most popular method is by 4WD with one of our drivers. See Getting to the camp by 4WD below. Secondly, there is now a new commercial flight from Marrakech via Casablanca to Zagora. From Zagora it is 3 hours to the camp. See Commercial flights below. Thirdly, by helicopter of light aircraft. See By helicopter and light aircraft below. It’s a spectacular trip—the drive is a reason in itself for visiting the desert. It’s an eclectic mix of mountain passes, lush valleys, Berber villages clinging to the mountain side, dilapidated kasbahs, palm groves and awe inspiring rock formations. It is simply an exciting voyage, as one travels through a myriad of landscapes from the frenetic activity of Marrakech to the calm and open vistas of the desert. The trip to the desert is quite long, about 9 hours, but it should not be rushed. There’s a timelesness about the desert, and the trip should not be governed by the need to arrive anywhere at a specific time. For sure, one wants to arrive at the camp near sunset, but you don’t want to hurry either. Ideally, the preferred itinerary, provided you have time, is to spend one night at a guesthouse en route to the desert, three nights in the desert and then return to Marrakech in one day via Foum Zguid (this being a circular route). However, if you don’t have so much time available, you can either drive direct to the desert, or reduce the length of stay at the camp to two nights. So, if you are going directly to the camp from Marrakech we suggest you depart as early as possible, about 07:00. If staying en route a departure sometime after breakfast is fine. Most guests take a 4WD with driver, not only because it is more relaxing and informative, but also because the camp is difficult to find and the drive in the desert quite technical. However, it is also possible to self-drive as far as M’Hamid and rent from there a 4WD with driver. For those seeking adventure you can rent a 4WD in Marrakech and drive to the camp although you will require a guide from M’Hamid. There is no specific itinerary, because everyone has different interests and wants to do things at a different pace. But, to give you some idea of the itinerary and sights, please click here for a sample itinerary. Bon voyage! Royal Air Maroc has just started commercial flights from Marrakech and Fez, via Casablanca, to Zagora. The flights operate on Monday and Thursdays only. This option only works from Fez to Zagora as there are no decent connections from Zagora to Fez. This flight is ideal if you are arriving in Casablanca, especially the flight from New York. Private charter flights are available. The helicopters are currently only allowed to fly to Zagora airport. A return trip is about 6500 euro (if returning within 20 hours). There are 9 and 18 seater planes available for private charter, from about 7000 euro for a return trip. The cheapest option are single engine flights that cost about 2400 euro for a return trip.